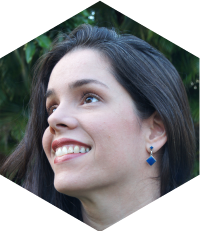 I became a freelance translator 17 years ago in my native Venezuela, out of my passion for languages, reading, and the art of translation. 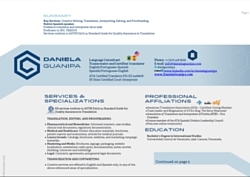 Soon after graduating from college with a BA in International Studies in Caracas, I submitted an application to work at a film production company that offered training as an audiovisual translator to candidates who were proficient in English and Portuguese. I thought it was a great opportunity while waiting to land a “real job”. I have never looked back. I relocated to the United States in late 2000, and lived in Indianapolis for over eight years. I believe this experience is what eventually allowed me to become fully bicultural. 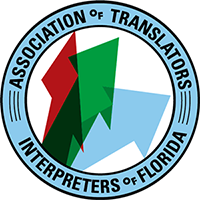 Through the years, I have acquired a great deal of experience; I became certified as a translator by the American Translators Association, and a certified interpreter by the Indiana Supreme Court. Although it might sound paradoxical, what changed my perspective as a freelance translator and helped shape my career, was the experience of overseeing translation departments for two different companies – one in Caracas, one in Indianapolis. Through these jobs, I learned the management and customer service aspects of this business, and I believe that is what sets me apart from most: my ability to understand my client’s needs and to translate it into action. At least once a year, I can be found at a translation-related conference, because I strive to keep my language and technology skills up to date. 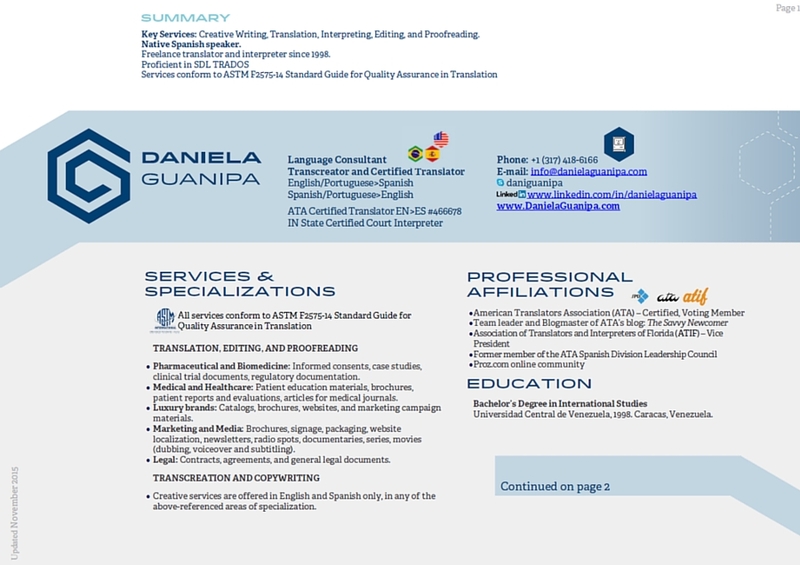 Yes, professional translators need to actively maintain their skills, just like doctors and attorneys. Remember, this is a profession! I currently live in Miami, Florida, with my husband and daughter. I still miss the Midwest – especially in the fall, my favorite season! But I have come to appreciate Florida and its undeniably wonderful weather, superb outdoor life, and the kaleidoscope that is the city of Miami. Click on the thumbnail above to preview my résumé. If you would like to receive a copy of the full version in PDF, please contact me.